for living well in this grinding war-spun world . . . 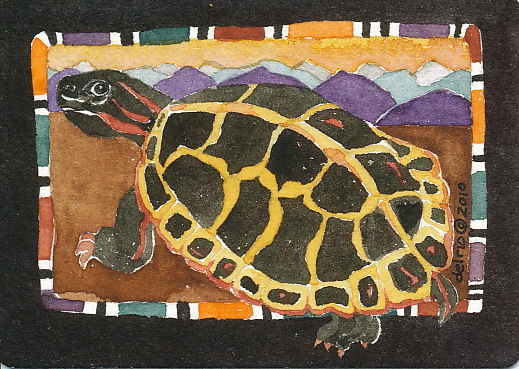 Turtle Island ~ in Iroquois tradition, when the earth was covered over with water, sundry animals attempted to create land by swimming to the bottom of the ocean and hauling up dirt. Muskrat succeeded. He placed the dirt on the back of Turtle, which grew into the landmass known today as North America. Maka Ina ~ Lakota (Sioux) ~ "maka" is earth and "ina" is mother, so Mother Earth. Earth teachings were/are considered a path to wholeness (heaven) by the First Peoples. Around the world–even in some of the countries most troubled by poverty or civil war or pollution–many thoughtful people are making a deep, concerted search for a way to live in harmony with each other and the earth. Their efforts, which rarely reach the headlines, are among the most important events occurring today. Sometimes these people call themselves peace workers, at other times environmentalists, but most of the time they work in humble anonymity. They are simply quiet people changing the world by changing themselves.” Eknath Easwaran, "Your Life is Your Message: Finding Harmony With Yourself, Others, and the Earth"
NextTEOTWAKI? Pass The “Wacky Ta-Bakkey”!